STEP 1: Select a visa category that best describes your trip to <?xml:namespace prefix = "st1" />China and prepare your visa application including necessary supporting documents accordingly. Please select a visa category based on your purpose of visit to China and click the category code to see detailed requirements. 1. Please submit your application to Chinese Embassy/ Consulate General based on your State of residence (Locate a Visa Office that serves your state). You may submit your application in person, or use an agent (Power of Attorney not necessary). Please note that you may be required to come to the Visa Office in person to have an interview as deemed necessary by a consular officer. 2. Appointment is NOT required for submission or collection of your visa. Walk-in service is available during office hours. 3. Please note that NO mail-in/online/fax applications are accepted. 4. You or your agent will be able to pick up your passport with visa on the date printed on your Pick-up slip, unless otherwise notified by the Visa Office. Mail-back visa service is NOT provided. 5. You must pay the visa fee once your application is processed and approved. 7. 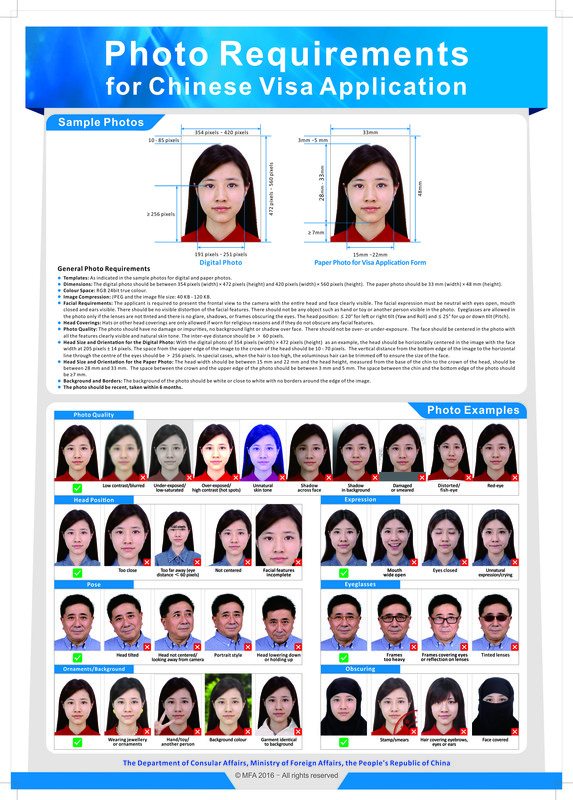 Photocopy of Chinese ID or foreign passport and permanent residence permit of the inviting individual . 5. The applicant should submit relevant certification in accordance with relevant regulations, and meet the relevant requirements of the competent authorities of the Chinese government on high-level talents and individuals with special skills urgently needed by China. A. Foreigners Employment Permit of the People's Republic of China issued by Chinese government authorities for Human Resources and Social Security; if your intended work period is 90 days or less, you need to provide an Approval of Short-Term Employment for Foreigners Working in P.R. China. You must apply for your visa before the commencing work date indicated on the Approval and you will be allowed to work only within the period of time indicated in the Approval. B. Permit for Foreign Experts Working in China issued by the State Bureau of Foreign Experts. C. Registration Certificate of Resident Representative Offices of enterprises of foreign countries(regions) issued by Chinese authorities of industrial and commercial administration. D. An approval document for commercial performances issued by the Chinese government authorities for cultural affairs; if your intended performance period is 90 days or less, you need to provide an Approval of Short-Term Employment for Foreigners Working in P.R. China. You must apply for your visa before the commencing performance date indicated on the Approval and you will be allowed to perform only within the period of time indicated in the Approval. According to the Nationality Law of the People's Republic of China, any person born abroad whose parents are both Chinese nationals or one of whose parents is a Chinese national shall have Chinese nationality. The child will be eligible for a Chinese Travel Document (Click to check how to apply for a PRC Travel Document). Original passport with at least six months of remaining validity and blank visa pages, and a copy of the passport's data page and the photo page if it is separate. One completed Visa Application Form with a photo on glossy photo paper glued onto the form (your photo must meet the requirements). The form need to be signed by one of the parents. Original unabridged birth certificate of the child and a copy of the certificate. Original and a copy of both parents' passports and proof of parents' immigration status in the U.S. (i.e. Green Card). 6. Other documents as required by the consular officer. 7. If the child never gets a Chinese visa after birth, all documents listed above from 1 to 6 are required. If the child has previously been issued a Chinese visa, document #3 &#4 can be waived, but a copy of the previous Chinese visa is required. 2. Parents of the child should guarantee that all information provided in the application is true and correct. Any false, misleading or incomplete information may result in denial of the visa or refusal of entry into China. 3. An applicant may be required to submit an original invitation, provide other supporting documents, or schedule an interview with the consular officer.